Scott Eggleston typically plays with The Soul Searchers Band, but will play Beaverdale Farmers Market as a solo act on June 28. 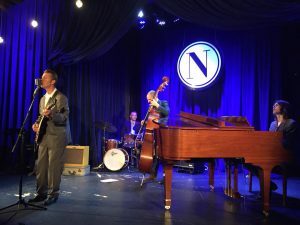 The photo is from the band’s opening for the new Thursday Blues Night series at Noce on June 3. He’s definitely worth a listen on a Tuesday evening. So grab some dinner and a beverage from our prep-food vendors and come on over, have a seat and enjoy Scott’s soulful mix of Blues, Rockabilly and Surf tunes.